Buddhism is famous for its analysis of suffering. We translate the pali word, “dukkha” colloquially as “suffering” but, as with most translations, it is inadequate. The word dukkha stands for the extreme mental suffering that comes with the loss of a loved one or the pain and fear brought on by an illness but these conditions do not capture the extent of the word’s profound nature. In its deepest sense, duhhka describes the unsatisfactory nature of all arisen phenomena. By unsatisfactory we mean that whatever worldly condition we experience, it is not enough to make us happy indefinitely. With time, the excitement and enjoyment we derive from the condition will fade and we will be left to seek out the next source of pleasure. When we learn to practice insight meditation, we are motivated principally by an understanding of this reality. Without that understanding, we would be so fully enamored with worldly delights that we would not allow time for a reflective practice. Nevertheless, it can be tempting to impart our worldly attitude of pleasure seeking onto the meditation practice so that it just becomes another form of grasping at good feelings. That of course would be fruitless since it would be no different than what we are already doing. Therefore, if one attempts meditation with that attitude, he will likely not see much value in it. If we really want to overcome the emptiness we fear, we must look at what is happening in the here and now as a source of happiness. Instead of relying on the happiness that is just around the corner, a new job, a bigger house, the next pleasure experience, etc, we must resolve to find happiness in our everyday tasks and routines. That requires that we become and stay aware of what we are doing which is easier to write than it is to do. The insight meditation practice that was handed to us from the Buddha is a method to train the mind in that discipline. 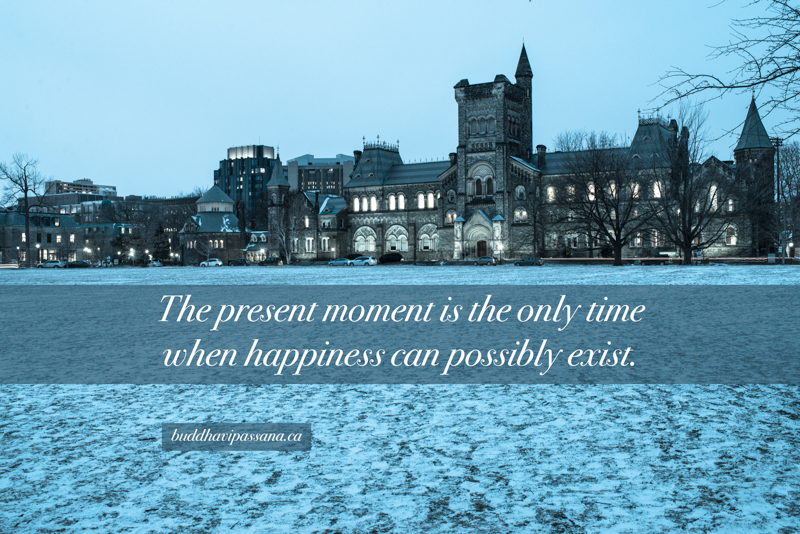 When the mind starts to look for happiness in something that may happen tomorrow or wishing that the past could be something different, we rely on our training to bring the mind back to the present moment, the only time where happiness can possibly exist. We sincerely hope that you can discover that what I have described is true from your own experience and, therefore, I encourage you to attend one of our upcoming meditation retreats.